Former Swansea City midfielder Ferrie Bodde has woken from an induced coma, after developing pneumonia, says a spokesman for the retired player. Bodde, 31, is head coach of Dutch amateur club SV Wateringse Veld. His spokesman, Jeroen Van Eijndhoven, said while Bodde remains poorly - he is "doing very well - and we expect him to make a full recovery". "Ferrie has heard about the support he has been getting from the Swansea fans," he said. "He wants them to know that he appreciates it very much. "He will be watching the Swansea game [against Aston Villa] live on the television from hospital. "He has a long way to go yet, but he is doing well." 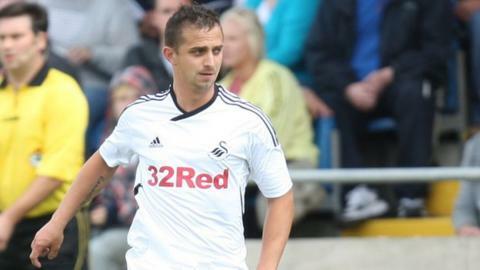 Bodde joined the Swans under then-manager Roberto Martinez in June 2007 from ADO Den Haag and left in July 2012. He suffered three cruciate knee ligament injuries during his time at Liberty Stadium. Bodde had joined the club for an initial £50,000 in 2007 and proved a bargain.